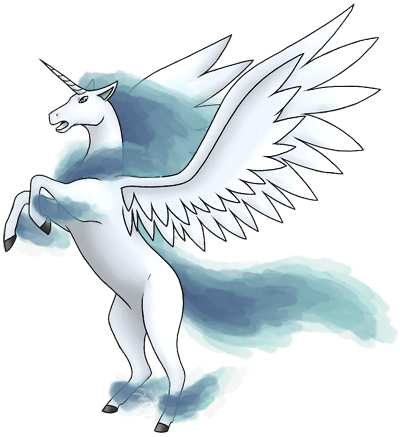 This pokemon was once ridden by champion knights in the olden days. It now lives deep in mountain areas. This pokemon is rarely found in the wild, traveling in a herd of five or less. Its diet is mostly the grass and flowers that grow on the cliff face. Upon evolution, it has left the calming meadow to living in the rocky mountains where it can live without being disturbed. It likes the freedom the open skies give it and doesn't like to be kept from it. Taming this pokemon is very difficult as you must be strong and brave to earn its respect, it is only then will it let you ride with it in the sky.